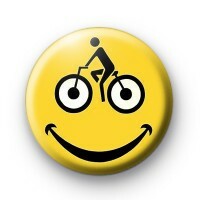 Yellow cycling badge for Walsall Bike Project featuring a cyclist sign in black and a smiley face on a yellow background. These custom cycling badges are for Penny at Walsall Bike Project. Do you need a custom badge for your cycling club or bicycle charity? We hand make our button badges in our family workshop & we can make up custom badges for you, based on your sign or logo. Get in touch with your ideas, we would love to help.